Boise Traffic and Commuting. What’s It Like? That being said, quality of life for an eight to fiver can be greatly enhanced or diminished by time spent in traffic, so let’s talk commute. population 216,282 with about 48,000 that commute into Boise each day for work. 78 percent (84,500) of the workforce live and work in the city. How well has Boise planned and developed the roadways? Good question. The Idaho Transportation Department (ITD) is admittedly working hard to keep up with growth (yes, the road improvements are behind the curve—definitely an area for improvement). Yet even with the ITD working hard to make up lost ground, the Boise commute is still a vision of gumdrops, lollipops, rainbows, and unicorns compared to tech hotspots such as Austin, San Francisco, and San Jose. Area Vibes, the average one-way commute for those working in Boise is 17 minutes. That’s 31 percent less than the national 25 minute average. 87 percent of Boise commuters (those not using public transportation) have a 30 minute or less commute. Not too shabby! city-data.com provids this nifty chart cataloging the Boise commute times. And, we should mention, that chart is referring to the time it takes during high traffic hours—or, should we say, high traffic hour. Singular. Unlike the big cities, where the traffic seems endless and lasts for hours on end, our rush hour is just that, an hour … usually between 5 and 6 p.m.
No. 3 position on Allstate’s Best Drivers Report, you can commute assured that a reckless driver rushing home (probably) won’t ruin your day. Boise State blue turf, the greenbelt has its own prominent charm and notoriety. What began in the 1960s with a few miles of pathway along the Boise River is now a 25-mile paved and cared for path along the river. 25-mile stretch offers a tree-lined pathway along the river through the heart of the city. Cared for by the Boise Parks and Recreation, it’s considered an extension to the city’s many popular riverside parks. Residents can often be found on a leisurely stroll or bike ride on the greenbelt, enjoying the scenic views and wildlife habitat, or enjoying the great Boise outdoors on their way to and from work. 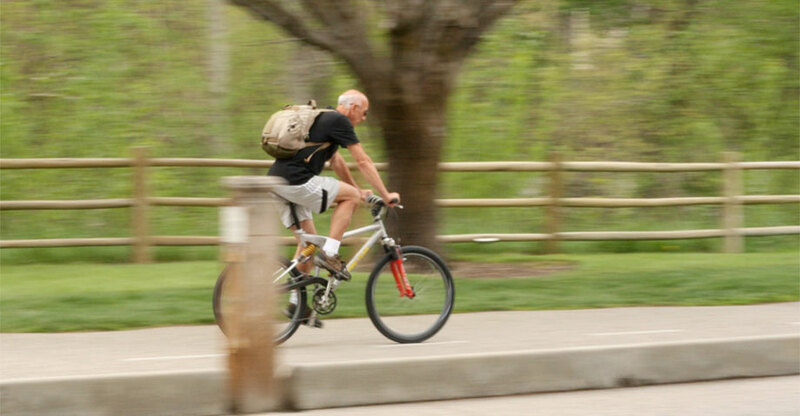 Eagle (a suburb of Boise), and it would not be uncommon to see TSheets employees en route to or from work on their bike, or enjoying a daily run, walk, or a quick fishing break by means of the Boise greenbelt. Unfortunately, for commuters who work off the beaten path (er, in this case, the greenbelt), commuting by bike isn’t always a great option. The major east/west corridors (Chinden, Fairview, or State Street) unfortunately don’t have bike lanes in place, making for a risky commute for those on bikes. The same goes for those commuting down the north/south corridor of Eagle Road—where speed limits exceed 55 mph. Avid bikers have been able, and will continue, to find safe routes to bike to work, although often concede to routes that are out of the way. Downtown Boise did make a valiant effort to improve the city for bikers in the summer of 2014 by implementing prominent bike lanes on major downtown roads. The pilot program failed with 55% of the 11,000 surveyed opposed to the 20% increase in commute time and loss of street parking, and the increase in bikers using the lanes deemed to not be enough to make the tradeoff at the time. Boise as a whole loves bikers! If you’re a business owner looking to reduce the expense of the commute for your employees, commuteride will offer their expertise to help you develop and implement a custom commute program for your team. And better yet, their assistance is free. currently investigating a downtown circulator system (by means of either bus or streetcar) that will (hopefully) lessen the traffic in downtown Boise and strengthen the heart of the city as an employment center—making it easier for students and employees alike to navigate our growing downtown. a whole bunch of money to map out their future plans. Change is a-coming! If you need a ride to or from the airport, down or around town for dinner, or simply enjoy NOT being in the driver’s seat, your options abound. they ordered Uber to cease doing business in the city back in 2014—the city has since come to terms with the ride-sharing service and Uber is back and better than ever in the City of Trees). US Taxi Service is known for its clean cars, and professional and timely service. Its loyal clientele all say to call Enes at (208) 941-3451. So go ahead—you won’t regret it! Nitro Cab is a clean car as fast as greased lightning! (Um yeah, we took some liberty there, it’s not actually in the reviews or has been stated anywhere … ever.) But according to his clients, Juan does provide a clean car, is consistently on time, and delivers exceptional service. Call Juan at (208) 577-6593 for Nitro Cab. B & W Taxi has an exceptionally happy client base. They only accept cash, so plan accordingly. You can reach them at (208) 412-8283. Have your own ride but suddenly need a driver? No problem. Get both yourself AND your car home safely with these designated driver services. Buddies Designated Driver service to get you and your ride home safely. Give her a call (and yes, it’s okay to be on a first name basis with the ride dispatcher … some of us may or may not have some experience in this area) at (208) 870-7271. MyDD will get you and your car home safely, but they’re also available for corporate event reservations or on those occasions when you simply need to rent-a-driver for a day for those trips to the airport, outpatient surgeries, or times when you simply need a driver to shuttle you around. They can be reached at (208) 918-0987. With only one terminal, our Boise airport is easily navigable and rarely crowded. On a good day, it only takes about 15 minutes to get checked in and through security. The Boise airport (BOI in airline speak) is a quick drive from almost anywhere in Boise (including surrounding areas) in about 20 minutes. Like a 7-Eleven, the Boise airport serves customers 24 hours a day. Unlike a 7-eleven, the ticket counters and check-in kiosks in the Boise Airport may or may not be open all hours (see their hours below). To check in for a flight—or weigh your luggage when no one is looking—the ticket counters can be found on the 2nd floor of the terminal. The official word from the major airlines suggest you arrive 90 minutes prior to departure (two hours during high travel seasons). The unofficial word from those who live in Boise suggests it’s only necessary to arrive 40 minutes prior to departure. Bogus Basin ski resort located at the highest point of the Boise Ridge Mountains—a scenic backdrop to downtown Boise. Looking for great local food while waiting for your flight? Try 13th Street Pub Restaurant and Bar (located pre-security), the Bardenay Restaurant and Bar (post security in the food court area), or just grab a fresh brew of coffee from our fav Big City Coffee in Concourse B, or Harvest & Grounds in Concourse C.
information on other services in the airport, such as ATM, US post office drop box, chapel, and more. And, of course, there is free wi-fi throughout the airport; we are a tech town after all! To get off the commercial airline path in these blue Idaho skies, you may need to charter a plane. Plenty of options abound. If you’re wondering how we can be a rising tech town with short commutes, even shorter airport security wait times, a vibrant outdoor lifestyle and a high quality of life—it really can be summed up in four short words: It’s a Boise thing. Maybe it’s time you were here.